Tadashi Ayada, Ryoshoen bonsai garden in Takamatsu's Kokubunji town, is well known as an expert in Tsugiki (grafting). By the propagation, a young tree can have the same nature of parent tree. In addition, it can be used for the trees which is hard to do Misho (grown by seed) and Sashiki (cutting). Ayada did Tsugiki with 10 species of pine trees and it helps the resource protection. He has done Tsugiki for about 50 years. About 30 years ago, he began to specialize in it. He smiled and said, "I don't know how many trees I have cultivated. Some trees became famous as the masterpieces." 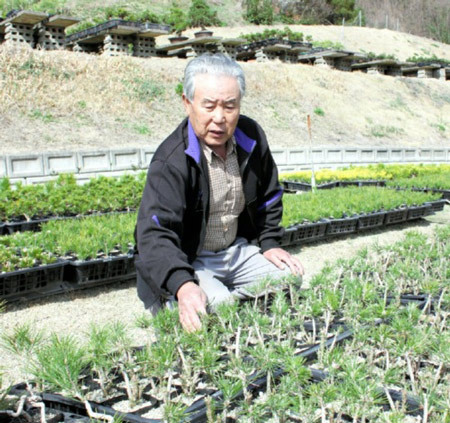 In the largest bonsai producing area in Japan, he thinks his work is to supply the material. 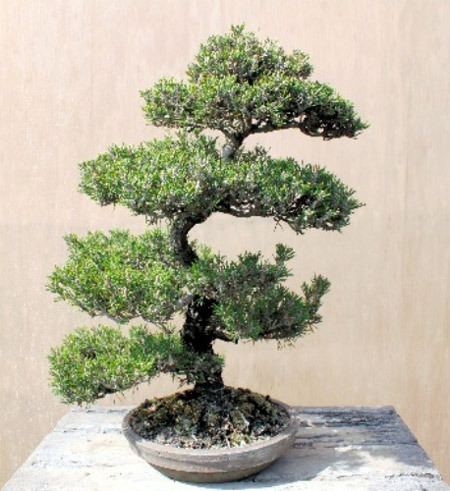 He said, "Of course, the masterpieces of bonsai are the representative art works of Japanese culture, however they are cultivated by the artists in Kokubunji and Kinashi. It is my responsibility to supply the rich materials to them. I think it is good to cultivate an easy material that people who are interested in can buy freely." He is a man of modesty. People expect his excellent skill which develops the rich material will prevent the trees from exhausting in the future. Ayada has many young grafted trees in his field. There are multicolored 10 species such as popular Senjumaru, Senjuhime, Yumenishiki, Ougon, Sunsho, Janome, and etc. 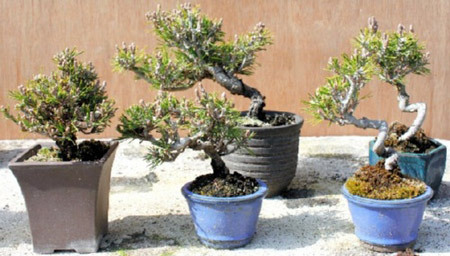 Senjumaru is a mutation of Kuromatsu (Japanese black pine) Kotobuki, and Kuromatsu Kotobuki Yatsufusa was born from the same tree. It has many buds and the short dark-green needles. Also it grows fast so it is good to arrange in Shohin. Compared with Senjumaru, Senjuhime has the soft needles and feminine atmosphere. Ayada uses many techniques freely such as "Teitsugi" which a scion grafts at the bottom of a stock, "Takatsugi" which is a way to graft a scion to the split apex of stock, and "Mikitsugi" which makes a new branch. It is important for every way to make the graft point inconspicuous. He says, "The key of Tsugiki is knowledge, experience, technique, and sense." For the future, he teaches his technique to young artists.